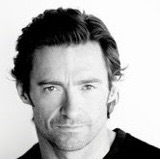 I am amused by Hugh Jackman’s name. All the time I transpose his name to ‘Huge Ackman’ and it makes me laugh to myself. This morning he appeared on CBS Sunday Morning to talk about his fair trade coffee company, Laughing Man. The story touched me. The back story is that he was doing a documentary on coffee growers in Ethiopia and met a man who influenced his life in surprising ways. This man was happy and made him laugh, for one. Hugh found himself pulled in and before long, he was opening a coffee store he named Laughing Man, after this happy Ethiopian. He since has opened additional stores and gives all proceeds to charity, like Paul Newman did with his salad dressing. His business is successful and lives have been affected. I’m skipping a bunch of the story because I want to get to the good part. The part where Hugh talks in a way that I completely relate to. The part where he talks about watching people’s lives change. His experience resonates deeply with me. But I never can quite describe it. Like I’m in a jet stream flying where the air takes me. Like I’m a marionette being controlled by something that wants me to go in a certain direction. But now today, thanks to Huge Ackman, I can say it’s like things have conspired and I’m saying yes and giving it a go.